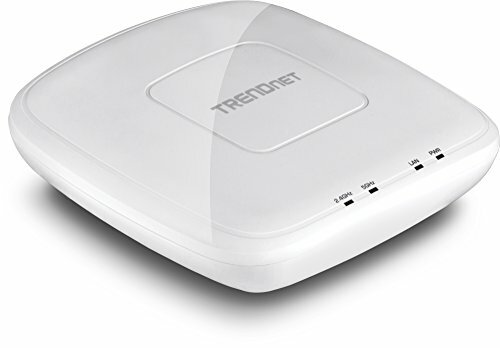 Equip your business with a manageable and cost-effective AC1750 wireless network with TRENDnet's AC1750 Dual Band PoE+ Access Point, model TEW-825DAP. Broadcast concurrent 1300 Mbps Wi-Fi AC and 450 Mbps Wi-Fi N networks. Relieve congestion and overcrowding on the 2.4 GHz band by employing band steer technology. Power the access point with the included AC adapter, or connect via PoE+ for installation flexibility. The low-profile design blends into most environments and includes a convenient ceiling/wall mounting plate. EASY TO MANAGE & COST EFFECTIVE: Equip your home or business with this TEW-825DAP Dual Band PoE+ AC1750-concurrent 1300Mbps WiFi AC + 450 Mbps WiFi N Band wireless Access Point. RELIEVE NETWORK CONGESTION AND OVERCROWDING: Band steering technology alleviates network congestion by automatically directing wireless devices from the 2.4 Ghz band to the 5 Ghz band. ACCESS POINT FLEXIBILITY & FEATURES: Support multiple applications with AP, Client, WDS,WDS Station, WDS Bridge, Repeater Modes, Wifi Traffic Shaping, 802.1Q VLAN assignment per SSID, IPv6 Support, Traceroute, STP, and web based management. 3 YEAR WARRANTY & TOLL-FREE TECH SUPPORT- TRENDnet backs this product with a 3 year manufacturer warranty as well as toll-free tech support.